34,000 spectators witnessed the successful debut of the DTM around the Circuit Bugatti at Le Mans and yet another thrilling race, in which Tom Kristensen was the best Audi driver. The Dane had put himself in an excellent position, to possibly take the championship fight all the way to the Hockenheim finale on 29 October, after securing a front row slot in qualifying. However, at the start the Dane lost three positions and the title chances as a result. Kristensen fought his way back up to third. Kristensen nevertheless dropped to third overall in the championship standings and is now three points behind Bruno Spengler. Fifth position for Bernd Schneider was enough to win the title with a race to spare. 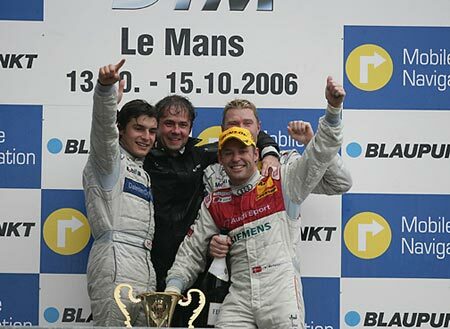 Barcelona winner Martin Tomczyk secured fourth place in the 2006 DTM championship standings with one race still to run after finishing a fighting fourth at Le Mans. The youngest Audi factory driver cannot be caught by two-time Formula 1 World Champion Mika HÐ´kkinen, who sits immediately behind Tomczyk in the standings, at the last race at Hockenheim. Tomczyk worked his way from eighth on the grid to fourth position during the race at Le Mans and successfully repelled the advances of new DTM Champion Bernd Schneider in the closing stages of the race. Timo Scheider as highest placed finisher in a year-old A4 claimed one more point for Audi in eighth position. Christian Abt and Heinz-Harald Frentzen completed the top ten. Frentzen lost a possible points scoring opportunity after an attack from Mercedes driver Jamie Green, who received a “drive throughâ€ penalty as a result. The race for Mattias EkstrÃ¶m and Frank Stippler was already over on the first lap: The two Audi drivers were involved in a spectacular collision in the chicane, which necessitated a safety car period. Daniel la Rosa (Mercedes), – 32 laps.